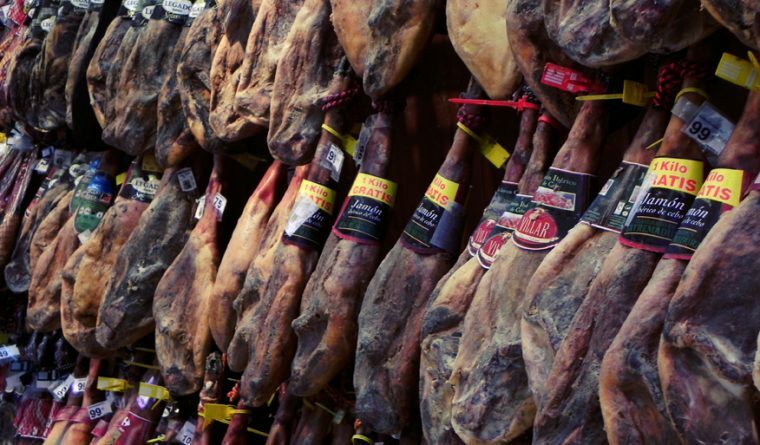 When it comes to Spanish food, there is nothing so iconic as the famous Spanish ham. Simply what could be better than a plate of Jamón with cheese, olives and a glass of red wine, while watching the sun go down? 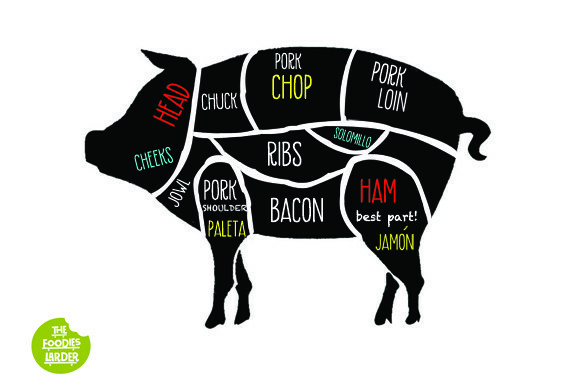 The Spanish connection to pork can be traced back to a rural past. So important was the pig in rural communities, that it could literally determine the fate of the poor farming families. Once the pig was fattened, nothing at all would be wasted. And because nothing could be wasted, there had to be a way of preserving the meat from ruin and so out of necessity began the process of curing hams in which they are still largely cured today. Whenever you see a ham hanging in a supermarket or bar, it is humbling to think that they are the way they are owing to humanity’s will to survive. Spain produces some 40million hams per year, yet there are basically only two different types of cured hams: Jamón Serrano, literally translated as “ham from the Sierra or mountains” (the majority of which are from the Landrace breed of pig) and Jamón Ibérico (Iberian ham) from pigs found on prairie-like land known as the Dehesa. 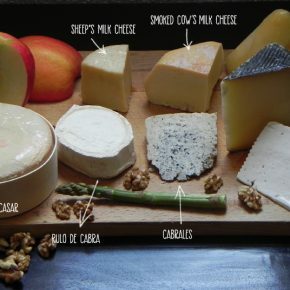 The Dehesa once covered almost 90% of Spain but now only remains in the regions of Andalucía, Extremadura and Salamanca. The Iberian pig is thought to have been introduced by the Phoenicians, who then interbred them with native wild boars – so their colour is generally on the darker side of grey. In Spanish this pig is called Pata Negra (black hoof). You can find these beasts grazing in the Dehesa, rummaging around for fallen acorns from the great Holm Oaks, Gall Oaks and Cork Oak trees. It is from this diet and the pigs being allowed to roam free in the forests that give the meat its rich, enhanced flavour, and the streaks of fat stored between its muscle fibres that makes this ham a cut above the rest. Jamón Ibérico de Bellota (acorn): The finest of all hams. Free range pigs that roam the oak forests. The meat is cured for at least 36 months. Jamón de Recebo: The pigs are pastured and fed a mixed diet of acorns and grain. The meat is cured for at least 24 months. Jamón Ibérico de Cebo: The pigs are fed on grain and the meat is cured for up to 24 months. Jamón Serrano comes from the white pig. This pig is a hybrid that has been bred with many different breeds, and therefore not having the same quality as the Iberian pig, this product is cheaper to buy and accounts for the majority of hams sold in Spain. There are 3 main varieties of Serrano ham: Serrano Bodega, Serrano Reserva, and Serrano Gran Reserva. They all have a similar curing time, but no more than 15 months. Producing hams is not a job for those who are impatient to see a quick return on their labour. If, for example, you worked in the Jamón Ibérico de Bellota department, you would have to wait 3 years before seeing a result! The process of producing hams is a lengthy one indeed, but it is also very technical, with the traditional ways handed down from generation to generation still being used today. From the initial stage of salting, the hams then go through a period of hanging in different temperatures, whereby they are dried and matured according to the type of ham that is required. Apart from jamón, which comes from the hind legs, lomo de cerdo (pork tenderloin) is also very popular in Spain. Panceta (pork belly) is used to make bacon, and it doesn’t take much imagination to realise that almost any part of the pig could be ground up to make sausages and chorizo. Most of the sausage casings today will be synthetic, but the rural Spanish from a not so distant past would have made them from the intestines of the pig. The chops and ribs come from the spine, and pork fat, which can come from anywhere where there is a large build-up of fatty deposits can be turned to lard, which is used for cooking or spreading on bread in the same way as we use butter. And last but not least, let’s not forget the ears and trotters and that Spanish favourite that you can find in so many Tapas bars around the country: Carrilleras (Pigs Cheeks).